A compact hand-held hot air welder, designed for roofing membranes and similar applications. The BAK Rion welder is 120VAC 60 Hz, 1600 watts, and provides outstanding temperature control, ease of use using a step-less temperature from 20 to 650C and an air flow of 250 L/minute. Adjustable temperature scale allows for an exact selection of temperature to fit your application. * A variety of welding tips are available for every application. * Standard Triac tips also fit. 50 Foot 15 Amp 125V Extension Cord, 12/3, Yellow SJTW UL/OSHA/ NEMA Approved Grade, Straight 5-15P Plug and 5-15C Connector (3-Wire, 2-Pole 125V). Price/Each. Bak Rion Replacement Carbon Brush Set/Pair (2 brushes, NO springs). Fits 2010+ 120V Model Bak Rion Motors (see application photo in detail view). Price/Set of 2. Replacement Heater Element Type 33 100.702 for Hot Air Welders, type 100.702, 120V 1600W. 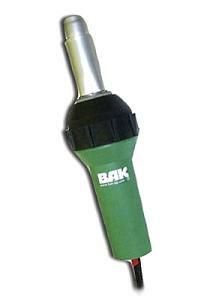 Fits standard Bak Rion Hot Air Welders and Triac-S models (non-digital verisions). Price/Each. Everhard Silicone Seam Roller, 4 inch wide x 2 inch diameter, dual fork, with hardwood handle, ball-bearing professional grade. Price/Each. Everhard Silicone Seam Roller, 2 inch wide x 2 inch diameter, single fork, with 5 inch hardwood handle and sealed ball-bearings. Professional grade. Price/Each.